Each Friday, I spend 90 minutes with 7 or 8 fourth grade girls at a nearby after-school program. I’m there to teach knitting, but mostly I just try to keep up with their questions, energy, anxieties, and aspirations. Last week, Lily finished the last couple of inches of a garter stitch scarf, a gift for her aunt who was coming over for dinner. Another knitter volunteered to model. I love her t-shirt — Try And Stop Me — which conveys the fierceness that so many 10-year-old girls possess. Since she joined my knitting class in the fall, Tracy has proved herself an intrepid and very generous knitter. Her very first project was a lovely GAPtastic shawl for her teen daughter. Her most recent finished project is a super cozy, very soft garter stitch baby blanket. It’s made with a super bulky acrylic yarn, something that can stand up to months (even years) of spits, spills, and washings. I always love to get photos of finished projects from students, friends, and family. There’s nothing quite like seeing a new item, something that has love knit into every stitch, in action. Like this lucky baby boy, wrapped in love. Fearless Knitter Rachel, she of the lovely chromatic cowl among other projects, emailed recently to show off her knitted tea cozy. 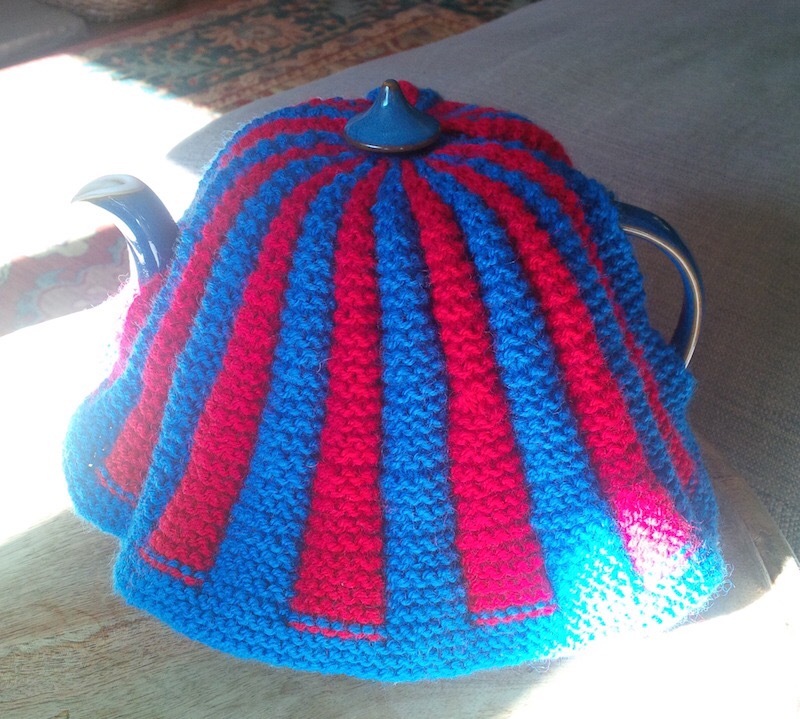 Knit in the round in garter stitch (I think), it’s bright, snug, and sure to keep your teapot warm. Rachel’s from England so she knows tea. Looking for a gift to knit for a friend or relative? Do you have a Christmas gift knitting list? What’s on it? Mine’s not very extensive and is a secret for now. 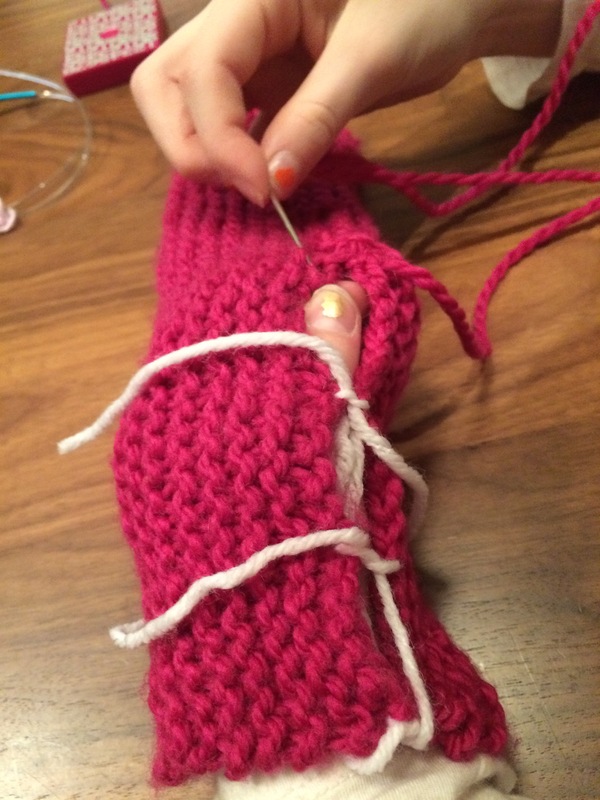 Longtime readers have heard how much I love to teach knitting. This year, I’ve expanded my students to include three marvelous pre-teen girls, each a Fearless Knitter in her own right. At our most recent class, L finished the garter stitch hat that she’d knitted with a rainbow of Noro. She had declared her previous garter stitch hat “too short” and was determined to make this one longer so that it’d droop in back.The last inch or so was completed and careful seaming commenced. The result is a tubular “stove pipe” that is gathered at one end. A big green pom pom was the finishing touch. I wasn’t surprised when B declared that she wanted to design her own striped leg warmers. 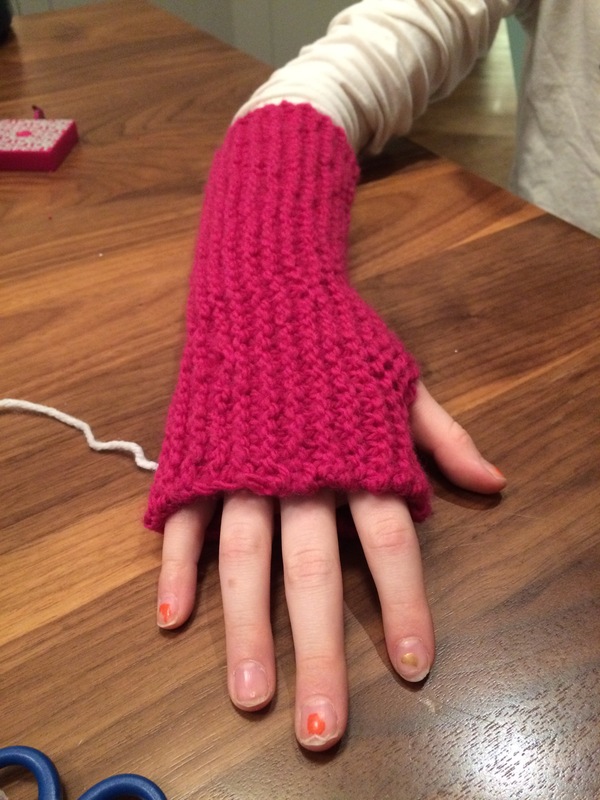 Having decided partway through her first garter stitch hat that she’d really prefer to make fingerless gloves, she’s a girl who has an image of a finished product in mind. Leg warmer #1 was seamed, ends woven in (you’ll have to trust us on that since they’re on the inside), and modeled. Being a dancer, B was particularly proud of her pointed toes in this shot. And she thought the sparkly sneakers were a great accompaniment to the leg warmer. Don’t you agree? Beauty can be found in the intricate and the simple and, sometimes, in the combination of the two. For example, the Albers Cowl, which takes the simple square and, like its inspiration, Homage to the Square by designer-artist-educator Josef Albers, invites an almost endless interplay of color. The cowl was the project featured in the cruise workshop on color theory. As you can see from the works in progress, the variety is beautiful. The knitting itself is quite simple: garter stitch (aka knitting back and forth). There’s also a fair bit of binding off and picking up stitches along the edges. I’ve used four colors for my first square: apple green (leftover from Color Affection), cream, gold, and black with flecks of purple and green. It’s a log cabin construction, starting with a square in the middle, then adding a thin rectangle along the bottom edge, one up each side, and another along the top. The second square uses three colors: the very last bits of the apple green, cream, and purple. It’s not yet done, but I like the combination. Pardon the shadow. I was knitting while waiting in line for the ferry and just dropped it on the bricks to snap a quick shot. What I don’t like is that this square is turning out to be larger (significantly so) than the first. Same needles but the flecked black is a different (smaller) yarn, so that may explain the difference. I’m not going to think about whether I’ll take apart and reknit the black border of #1 — at least, not just yet.